On July14, 2017 at 09:36 Moscow time, Soyuz-2.1a lifted off from Site 31 at the Baikonur Cosmodrome. The launch mission is to deliver an Earth observation Kanopus-V-IK satellite and 72 smallsats piggybacked under the federal and commercial contracts of Glavkosmos to their target orbits. MKA-N 2 6U-CubeSat (Russia, Dauria Aerospace in the order of Roscosmos). Ekvador UTE-YuZGU 1U-CubeSat (the South-Western State University). 72 smallsats make the mission setting a record in a number of spacecraft to be injected into several target orbits among smallsats launches ever. ~18:18:49 – Fregat upper stage reentry (altitude – 100km), sinking in the Indian Ocean. On July 28, 2017 at 18:41 MT launch vehicle Soyuz-FG and manned spacecraft Soyuz МS-05 with the crew of the next long-duration expedition successfully lifted off from Gagarin’s Launch Pad of BAIKONUR space center. The spacecraft was successfully put into low Earth orbit and is headed for the International Space Station (ISS). The spacecraft crew consists of spacecraft commander, ROSCOSMOS cosmonaut Sergey RYAZANSKY, NASA astronaut Randolph BRESNIK and ESA astronaut Paolo NESPOLI. Onboard the International Space Station Soyuz MS-05 crew will be met by ROSCOSMOS cosmonaut Fedor YURCHIKHIN and NASA astronauts Peggy WHITSON and Jack FISHER. Therefore, the Expedition 52 (ISS-52) crew complement will be augmented from three to six crewmembers. Spacecraft Soyuz MS-05 will approach the ISS using a short six-hour rendezvous capability. The spacecraft shall reach the station after about six hours and twenty minutes in the fifth orbit of its free flight. A fully automatic docking with the Mini Research Module (MRM1) Rassvet is scheduled for July 29 at 01:01 MT. The second Proton mission of 2017 lifted off with the first Blagovest communications satellite for the Russian Ministry of Defense. Blagovest is a Russian religious term meaning "good news." Due to the military nature of the payload, only limited information is expected to be released on the mission and no live coverage of the liftoff on August 17 was provided. A series of Blagovest communications satellites has been developed and manufactured at ISS Reshetnev in Zheleznogorsk, Russia, for the Russian Ministry of Defense. 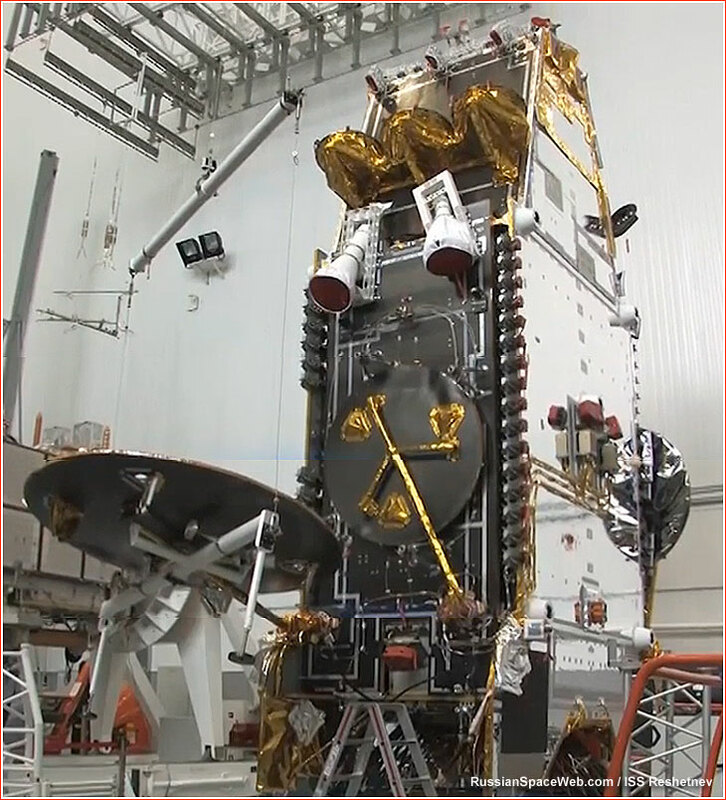 The Blagovest satellite is equipped with a new-generation communications payload developed by ISS Reshetnev in cooperation with the European consortium Thales Alenia Space. Operating in Ka- and C-band, the transponders were designed to enable a broad-band Internet access, data transmission, broadcasting of TV and radio-programs, video-conferencing and telephone communications. 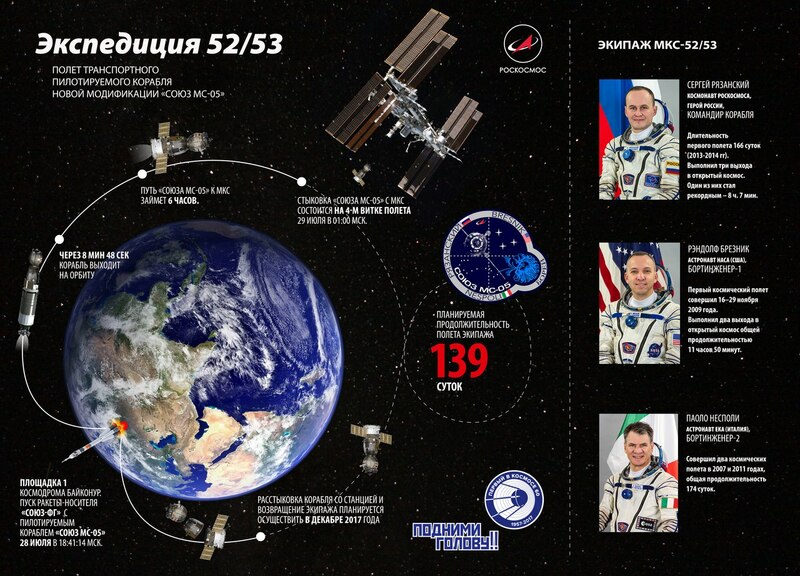 Though the satellite is to be owned and operated by the Russian military, it was designed to transmit via open communications channels, according to ISS Reshetnev. The satellite is based on the ISS Reshetnev's Ekspress-2000 platform, the company's largest standard spacecraft bus. 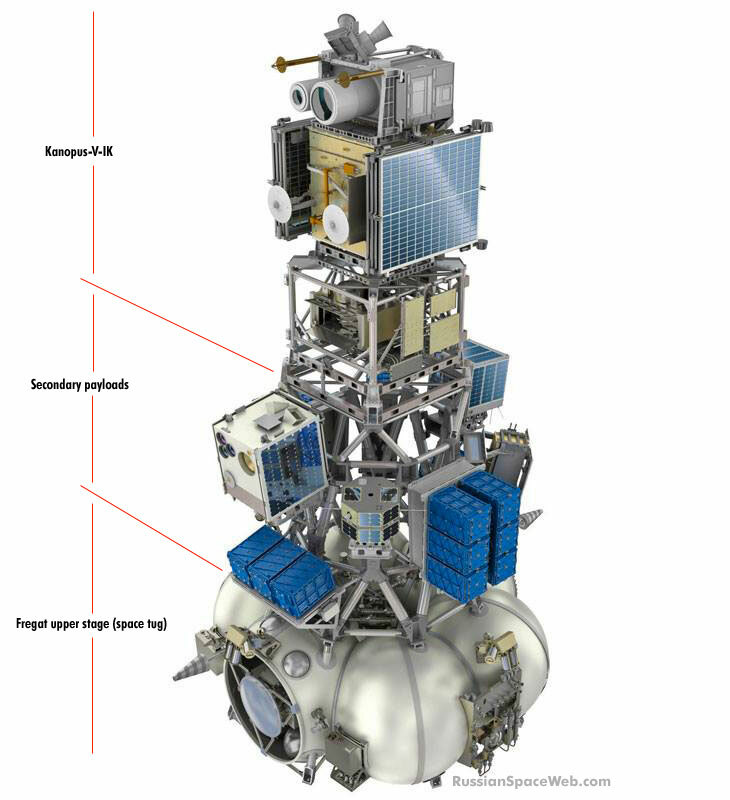 The comparisons of Ekspress-2000 to available visuals of the Blagovest reveal a large expansion of the payload module and enlarged radiators. MOSCOW, August 17. /TASS/. A Proton-M carrier rocket with a military satellite has been launched from the Baikonur space center in Kazakhstan, the press service of the Russian defense ministry said on Thursday. "A Proton-M heavy-lift launch vehicle with a defense ministry’s satellite has been successfully launched from the Baikonur space center," the press service said. The rocket was launched under control of commander of the space troops and deputy commander-in-chief of the Russian aerospace forces, Colonel General Alexander Golovko. "All pre-launch operations were conducted in a routine mode. The launch and the flight of the rocket were monitored by the ground-based automated control system," the press service said. On November 28, 2017 at 08:41 Moscow time, Soyuz-2.1b lifted off from VOSTOCHNY Cosmodrome. The launch mission is to deliver an Earth observation Meteor-M № 2-1 satellite, an Earth observation Baumanets-2 satellite and 17 smallsats piggybacked under the federal and commercial contracts of Glavkosmos to their target orbits. According the flight program, the first three stages of Soyuz-2.1b have taken the ascent unit into the specified intermediate orbit. However, during the first planned communication session with the satellite, it was not possible to establish a connection due to its absence in the target orbit. Currently, the information is being analyzed. Unofficial information reported that the Fregat had crashed in the Antarctica. 02.12.2017 at 10:43 UTC the Russian Aerospace Forces launched the Soyuz-2.1b launch vehicle from the Plesetsk State Test Cosmodrome in the interests of the Russian Defence Ministry. The vehicle was launched under the leadership of the Commander of the Space Forces – Deputy Commander of the Aerospace Forces Colonel General Alexander Golovko. Launch of the vehicle and orbiting of the spacecraft were successful. In three minutes the Soyuz-2.1b was tracked by ground systems of the State Test Centre named after German Titov. All systems of the spacecraft are functioning.